South Beach (or SoBe) is located within Miami Beach and has been called the Art Deco playground and the American Riviera. Here you’ll find world-class shopping, culinary delights, and clear blue water with white sand beaches. SoBe offers both casual and upscale experiences, but is generally for the well-dressed set. So, even if you’re hitting the beach, be sure to don a stylish hat and sunglasses before you walk out the door of your vacation rental home. South Beach is a free public beach. There’s plenty of parking and the municipal parking garages offer the best deals. Locals suggest getting there early as garages and open beach space fill up fast. Rental shops offer chairs and umbrellas. For less than $40 you can have both. Lifeguards are on duty during the day. There’s no shortage of food and drink options available along the beach. This miles-long outdoor mall has an open plan and is designed for pedestrians only. The promenade has top-notch fashion, art, architecture, and people-watching. Walk from Washington Avenue to Alton Road to discover a pop-up market where handcrafted jewelry, origami, and a variety of other handmade wares displayed casually on card tables or rugs laid on the ground. Lincoln Road also offers a boon of name brand stores and local shops and galleries. You can find an amazing lunch restaurant anywhere, but these offer spectacular views to remind you that you’re in dazzling South Beach. These beach views are coveted so make reservations ahead of time. Juvia is an upscale chic fusion restaurant blending Asian and Peruvian cuisines with a classic French flair. Celebrity-owned Larios on the Beach is made famous by its owners Gloria and Emilio Estefan and its spectacular views of South Beach and Ocean Drive. Their upscale Cuban food and mojitos make it perfect. Monty’s Sunset is located poolside and waterfront on the docks of Miami Beach Marina. Here casual dining means local fresh-caught seafood, a raw bar, and entertainment. 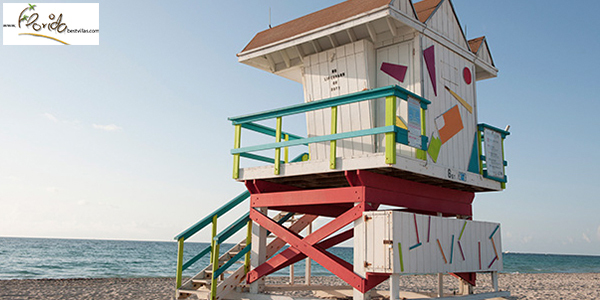 Miami’s South Beach is home to the largest concentration of 1920s and 1930s architecture in the world. It’s known as the Art Deco District. It’s recognized by the National Register of Historic Places and boasts 800 historical structures. The district draws visitors from around the globe. The Miami Design Preservation League (MDPL) offers the only official tours. Their Official Art Deco Walking Tour is a 90-minute tour that literally walks you through an introduction to the Art Deco, Mediterranean Revival, and Miami Modern (also known as MiMo) styles. Tours depart from the Art Deco Welcome Center at 10:30am Mondays through Sundays with an additional 6:30pm tour on Thursdays. Tours are $25 or $20 for seniors, veterans, and students. You can make advanced reservations, but they’re not required. Whether it’s from 5pm to 7pm during the week or 10pm to Midnight, there are always fun places you can drink and nosh on a dime. Streaming with light and perfectly chic, Byblos offers happy hour starting at 6pm with $8 cocktails and small bites for $12 and under. The comfortable Social Club is in the heart of Miami Beach and offers a late night happy hour with a flair for breakfast. It also offers $5 draft and 50% off wines by the glass. South Pointe Tavern’s happy hour offers 50% off beer, house wine, and cocktails. This entry was posted in Beach, Outdoor Adventures and tagged art deco, beach, beaches, Florida, florida best villas, FloridaBestVillas, happy hour, miami, South Beach, vacation. Bookmark the permalink.